ATLANTA, May 23, 2017 /PRNewswire/ -- May is Clean Air Month, and Georgia's Clean Air Force (www.cleanairforce.com) is offering expert tips on how to help improve air quality in Georgia while saving money. Modest adjustments in driving habits can significantly impact overall air quality. Regular maintenance can help keep your vehicle running efficiently, boost performance, improve mileage and allow you to monitor for issues before they become problems. 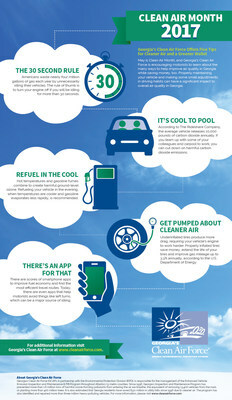 "For Clean Air Month, Georgia's Clean Air Force wants to help motorists in the Atlanta metro region learn about the many ways they can help improve air quality in Georgia, and save money," said Pamela T. Earl, Mobile & Area Source Program Manager, Environmental Protection Division. The 30-Second Rule. Nearly four million gallons of gas are wasted each year by unnecessary idling. Idling can allow harmful deposits to form inside of an engine, damaging vital components. Turn your engine off if you will be idling for 30 seconds or more. It's Cool to Pool. Telecommuting or carpooling to work is an effective way to contribute to cleaner air and to save money. The average vehicle releases 10,000 pounds of carbon dioxide annually. Teaming up with some colleagues and carpooling to work can cut down on harmful emissions. If you have a shorter commute, pledge to walk or ride your bike to work once a week. Get Pumped About Cleaner Air. Underinflated tires produce more drag, requiring your engine to work harder. Underinflated tires decrease fuel efficiency and can produce harmful emissions. Properly inflated tires can improve gas mileage up to 3.3% annually and extend the life of your tires, according to U.S. Department of Energy. Refuel in the Cool. Hot temperatures combined with gasoline fumes create harmful ground-level ozone. Experts recommend that motorists refuel in the evening when temperatures are cooler and gasoline evaporates at a less rapid rate. Also, don't forget to tighten your gas cap. Each year, 147 million gallons of gasoline vaporize due to loose, damaged or missing gas caps. There's an App for That. There are many smartphone apps to help motorists find the most efficient travel routes, including apps that help motorists avoid left turns, which can be a major source of idling.